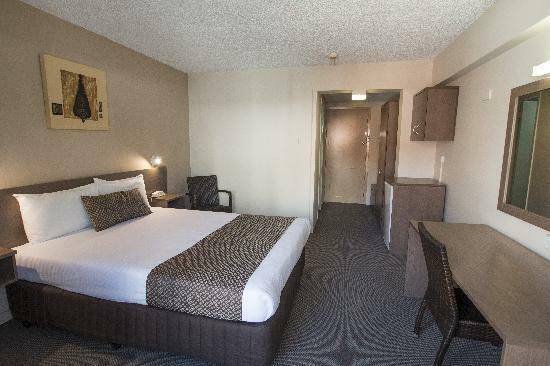 The modern hotel accommodation provided by the Metropolitan Motor Inn offers guests a truly relaxed ambience in the heart of the Brisbane city. Travellers can be asured of a warm welcome, friendly service and spacious guest rooms that are filled with all of the amenities to make you feel right at home. The Metropolitan Motor Inn a refreshingly different motel with standards of excellence in service and affordable accommodation in Brisbane's Spring Hill business district. For travellers who are after value for money hotel accommodation in Brisbane then the Metropolitan Motor Inn is the perfect place. This budget hotel features a variety of rooms that are designed for both business and leisure travellers as well as great amenities like lounge bar, business centre, conference centre, direct internet access, free car parking, guest laundry, lift, restaurant, room service, tour desk, fee pay parking and 24 hour reception. The Metropolitan Motor Inn is ideallt positioned within close proximity of the city centre, Central Train Station, Roma Street Parklands, Suncorp Stadium, Ballymore, RNA Showgrounds, hospitals, Aquatic Centre, Brisbane Cultural Centre, Botanic Gardens, SouthBank Parklands & Brisbane River. Deluxe Triple Room : Sleeps up to 3 guests on 1 Queen Bed + 1 Single Bed. Deluxe Twin Room : Sleeps up to 2 guests on 2 Single Beds.